A U.S. Air Force Thunderbird at the Daytona 500 in February. 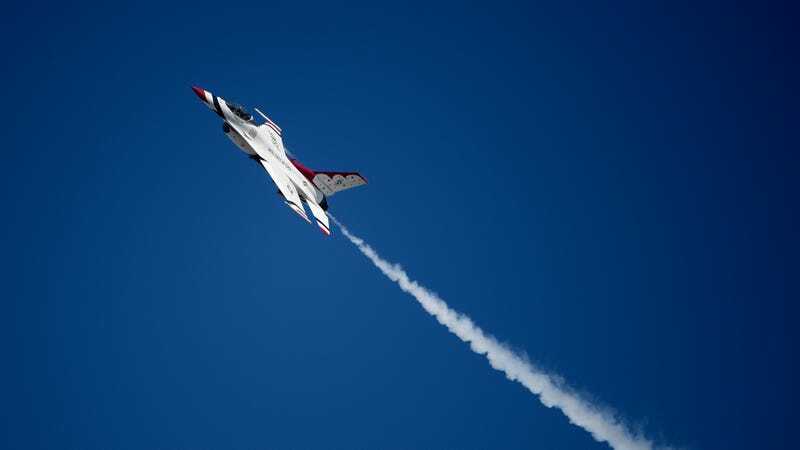 A U.S. Air Force Thunderbird pilot is dead after the pilot’s F-16 crashed during a routine training flight on Wednesday morning at the Nevada Test and Training Range, the Air Force said on Thursday. The crash was the third for the Thunderbirds in two years, following an incident in June 2016, in which the pilot ejected, and another in June 2017, when a Thunderbird jet ran off a runway, injuring two. The Thunderbirds last did a flyover at the Daytona 500 in February. A US Marine Corps AV-8B Harrier II jet crashed Tuesday during takeoff from Djibouti-Ambouli International Airport. The pilot was able to eject and is being treated. Over a dozen Thunderbird pilots have been killed since the squadron’s formation in 1953. The Thunderbirds are based at Nellis Air Force Base in southern Nevada, home of the 57th Wing.